A dog capable of sniffing out chemical and biological weapons that will be used in Los Angeles County was introduced at a press event this morning by officials from the Los Angeles Sheriff’s Department and Metro. The dog, a 17-month-old black lab named Johnny Ringo, can detect anthrax, ricin and other poisons. 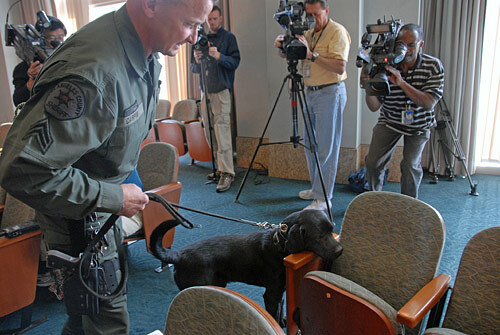 The dog will be available for patrolling Metro trains, buses and other facilities and for other uses in the county.